A Vertical piano is stored upright and with its bench. We bag it in plastic for protection from dust. 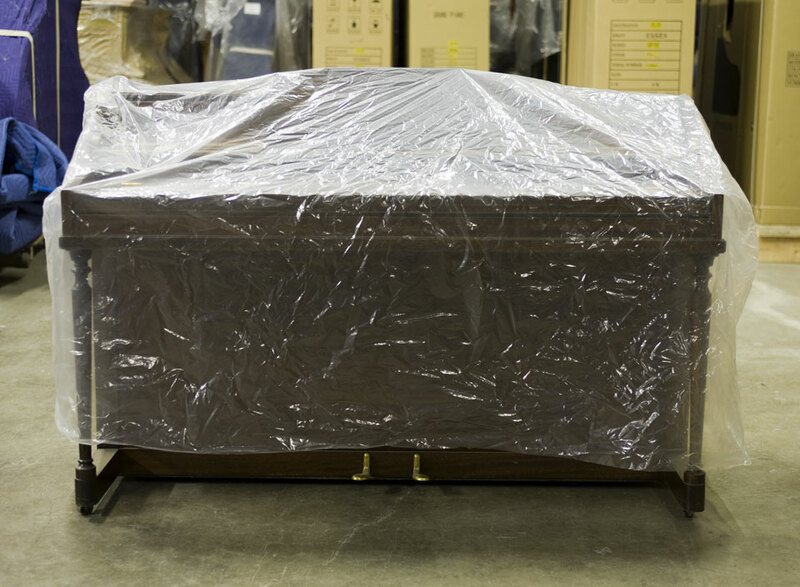 When we pick up your piano, we inventory it and ask you for its appraised or estimated value. Full insurance coverage is included in the storage rate. At the time of the move into our warehouse, we collect the move charge plus one month of storage. After that we typically bill every three months to avoid refunds if your piano is delivered sooner than expected. Also, storage is prorated so that a partial month is not the full $70. We also “hold” Verticals for less than a month for a $55 warehouse charge. This scenario is useful when you need your piano out of the house for a few weeks for remodeling or if you are moving and the old and new home closings don’t quite match. You pay the base rate for moving your Vertical (from one location to another) plus any extras (flights of stairs or mileage) plus the warehouse charge. If the temporary hold exceeds a month, we convert your invoice and charges to the normal monthly storage rate. Any questions can be answered with a phone call or email. The storage rate for a Vertical (any type) is $70 per month. Get two months of free storage if you pre-pay one full year!